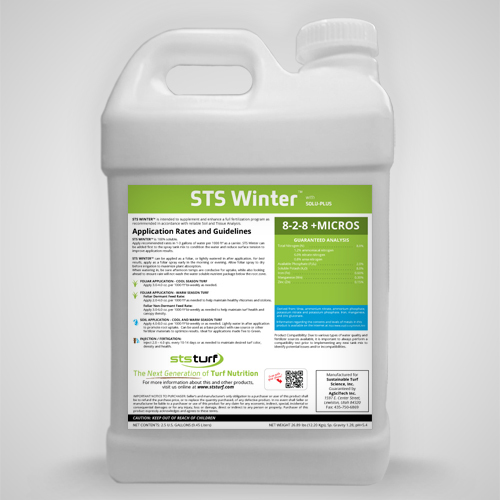 STS Winter 8-2-8 is engineered to enhance and support winter hardiness, while delivering a specific balance of nutrients to optimize plant availability during cooler temperatures. Technology driven, this product will help your turf conserve energy during shorter days, and low light intensity periods. Boasting short chain nitrogen, with 75% of the N being in the form of Nitrate Nitrogen to maximize absorption, STS Winter™ is built to promote efficient conversion of nitrate nitrogen to NH2, to ensure vascular balance and turf performance. This “Next Generation” product can be applied as a foliar spray, or watered in. STS seasonal products can be used any time of year, but focus on specific needs of your turf during certain periods. STS Winter 8-2-8 delivers 13 of the 16 essential nutrients, and boasts a number of plant beneficial, pre-digested compounds, vitamins, and enzymes. The addition of Solu-Plus plays a key role in assisting the nutrients into the plant and preventing restrictions. Our proprietary cold processed Solu-Kelp works synergistically to assist with stress resistance, chlorophyll formation and complete protein production. Other components include a full spectrum of amino acids, humic and fulvic acid, carbohydrates, plant defense elicitors, anti-oxidants and fermentation extracts.